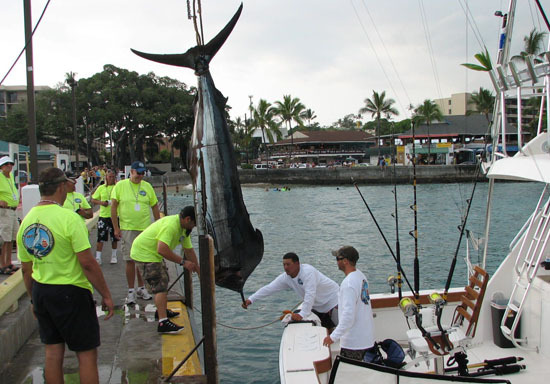 As the sun rose over Mount Hualalai, 27 teams were already gathering at Kailua Pier in excited anticipation of the first day of fishing at the 52nd annual Hawaiian International Billfish Tournament. Danny Akaka, son of U.S. Sen. Daniel Akaka and respected Big Island kupuna, delivered the traditional Hawaiian blessing and the teams were given the go-ahead start fishing signal at precisely 7:30 a.m.
HIBT anglers were ready to go as all teams were loaded aboard the impressive fishing fleet and on the starting line with 15 minutes to spare. The first two anglers to put points on the board this year were Susan Ward fishing with Old South Marlin Club #1 from North Carolina and Sally Kurz with Laguna Niguel Billfish Club-Col. Brooks Morris Memorial Team #1 from California. Close behind the wahine anglers was veteran HIBT angler and captain of the Kona Game Fishing Club-Taivo, Masaharu Matsushita. By the time the first official Tournament roundup was announced at 10 a.m., eight Pacific blue marlin and two short-nose spearfish had been tagged and released, earning valuable HIBT team points. By lunchtime, Team Old South Marlin Club #1 had tagged three qualifying billfish, PKU Sun Fun, China’s first HIBT team ever, had tagged its first Pacific blue marlin and 13 other teams had put points on the scoreboard. Members of the Old South Marlin Club have been fishing for years, yet a short-nose spearfish had managed to elude Randy Ward’s lifetime catch list. Back home in North Carolina, Ward received weekly calls from other Old South Marlin Club members taunting him about joining their short-nose spearfish club. Well, today he joins their ranks as the newest, and very proud, club member. Not to be outdone, Allen McGee, angler with Laguna Niguel Billfish Club-Col. Brooks Morris Memorial Team #1 boated the day’s only Pacific blue marlin, weighing in at 482 pounds. At the end of day one of the 52nd HIBT, points were awarded for 18 Pacific blue marlin, one boated, a striped marlin, 4 short-nose spearfish and 2 boated ahi. 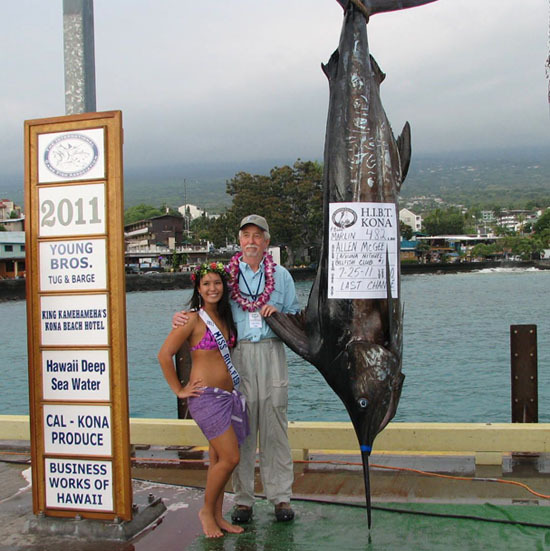 HIBT rules note that billfish points are awarded for any Pacific blue marlin, black marlin, striped marlin, short-nose spearfish and broadbill swordfish that weigh in at 300 pounds or more. 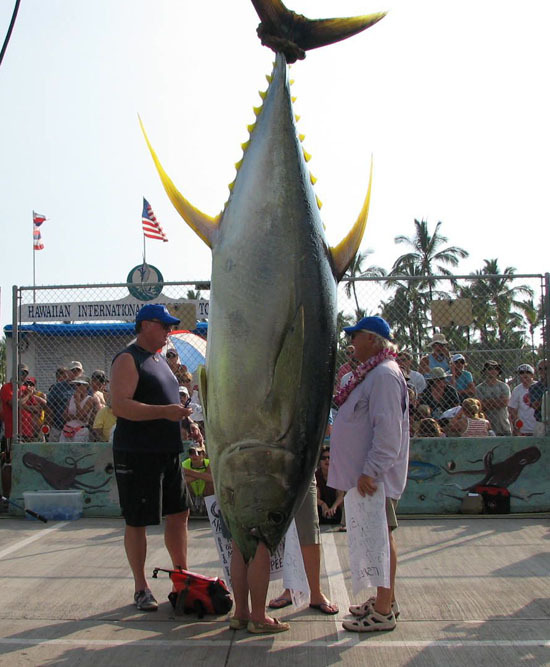 Tuna are awarded points per pound that weigh in at 100 pounds and more. 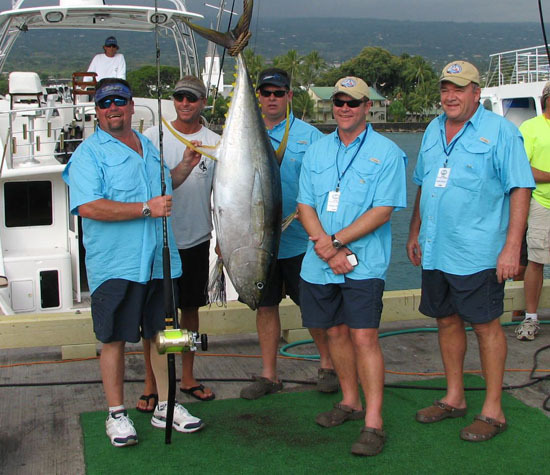 Bonus points are given for weighed fish over 500 pounds, for the heaviest qualifying marlin each day and the heaviest qualifying marlin of the tournament. Qualifying tagged and released billfish are awarded valuable points computed on line weights of 80- or 50-pound test. 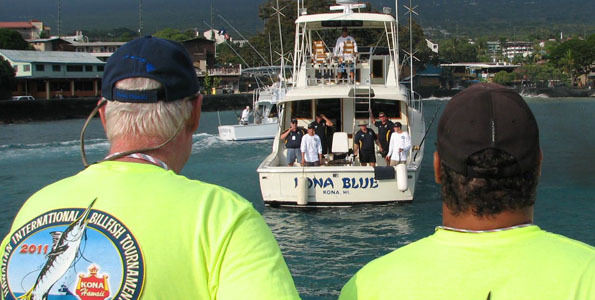 The Hawaiian International Billfish Tournament is underwritten by the County of Hawaii and sponsored in part by KWXX Radio and numerous other corporate and community donors.